The recordings contain the Tibetan teaching and its live English translation. Follow the teachings as podcast at: http://www.rigpawiki.org/Media/Audio/2009/uttaratantra.rss To automatically download all uttaratantra teachings with iTunes, select within iTunes: Advanced/Subscribe to podcast... and paste the podcast-link above. Be sure to select to download all episodes in Settings. 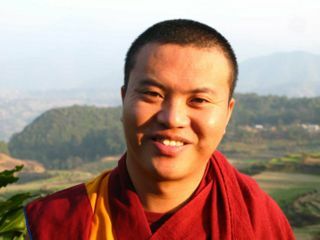 Currently, there is no English translation of Mipham Rinpoche's commentary available. John Canti, who is part of the Padmakara Translation Group, is currently working on a translation of the commentary as a Tsadra Foundation fellow. Please check the Uttaratantra Shastra article for a list of available commentaries. A good study reference is Dzongsar Khyentse Rinpoche's commentary on the Uttaratantra Shastra that's available for free download on the Khyentse Foundations's Original Publication download page upon request. While Dzongsar Khyentse Rinpoche does not strictly follow the commentary we are studying, he promisses: I'm going to use Mipham Rinpoche's commentary, and also hopefully, if I have the capacity to understand and explain it to you, I will extract some of the teachings from the commentary, the Senge Naro or "Lion's Roar", so I guess you will he be hearing a lot of Shentong stuff! Mipham gsung 'bum p.358-361, verses 6-8. Mipham gsung 'bum p.361-365, verses 9-14. Teaching of 08-Jan-2009: The Qualities of the Sangha. The three Types of Refuge. Mipham gsung 'bum p.365-368, verses 15-20. 3.2.2 Detailed Explanation of the other four Vajra Points and how they are attained. Teaching of 09-Jan-2009: The Ultimate Refuge. The last four Vajra Points. Mipham gsung 'bum p.368-371, verses 15-26. Teaching of 10-Jan-2009: The fourth Vajra Point: Buddha Nature. Mipham gsung 'bum p.371-373, verse 27. Note: This chapter is a comment on the three reasons given in verse 27 for the fact that all beings have buddha nature. Mipham Rinpoche's commentary is very closely related to the sengge naro commentary and often entire passages are identical. So it's very well worth comparing with Khen Rinpoche Namdrol's teachings on the Sengge Naro commentary. Teaching of 11-Jan-2009: How the Dharmadhatu pervades everything. Mipham gsung 'bum p.373-376, verse 27. Mipham gsung 'bum p.376-378, verse 27. Mipham gsung 'bum p.378-379, verse 27. Teaching of 15-Jan-2009: How the Dharmadhatu pervades everything. The Third Argument. Mipham gsung 'bum p.379-382, verse 27. Teaching of 16-Jan-2009: The Third Argument (cont.). The Ten Aspects of the Element (khams). Mipham gsung 'bum p.382-386, verses 28-33. This page was last edited on 28 July 2015, at 11:20.